The FZ-1 takes advantage of Mission’s new technologies combined with trusted features from past models, resulting in a comfortable, high-performing skate. The Mission Inhaler FZ-1 inline skate is made for the elite-level skater who is looking for a wide array of performance features at a great value. The FZ-1 features a grip liner with Indy foam pads. This technology gives you the comfort you’re looking for in a high-end skate, while also keeping your foot locked in place as the game goes on. This grip liner is complemented by neoprene ankle padding inside the skate. This flexible material helps to increase support around the ankle, and when combined with the liner, helps to produce an all-around comfortable boot. This model also includes a 10-mm, 52-oz form-fit tongue with metatarsal padding for increased protection. A new feature in this Inhaler model is the Off-White Curv quarter package with ventilation and abrasion guards. This technology provides you with enhanced stiffness and lateral support through the boot, allowing you to maximize energy transfer with each stride. Curv also helps to keep your foot cool, comfortable, and protected throughout the game. The boot is also thermoformable, with an anaform upper that allows the skate to mold to your foot for a personalized fit. This elite-level model also comes with top-end wheels. 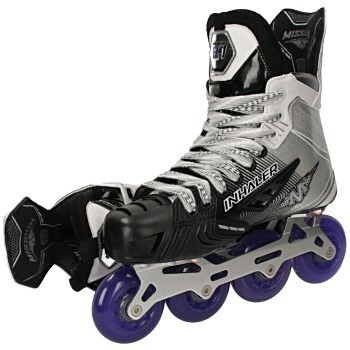 The Inhaler FZ-1 features Labeda Addiction wheels, designed for the power skater in mind. The Addiction grip has a hard center urethane core and a hard inner speed ring, helping to flex and grip with every stride, matching each player’s skating style without compromising wear. Mission partners the Labeda Wheels with their CNC HI-LO Aluminum chassis on this model. The frame uses a unique design allowing for a difference in wheel size - two 76-mm wheels on the front and two 80-mm wheels on the back, which promotes both enhanced speed and control. With this chassis design, you get the benefits of both smaller and larger wheels to give your stride an extra performance boost. Like the FZ-0, the Inhaler FZ-1 includes a newly shaped tendon guard with color chip inserts for personalization. These color chips are also available on the ankle, helping you to further customize your skate style. With these personalized options, as well as the excellent performance features included, Mission’s FZ-1 proves to be an excellent option for the player looking for an elite level option at a lower price point.